Set the vehicle on a lift so that the vehicle is kept level when it is lifted up (make sure that the tilt angle from the front to rear of the vehicle is within +/-1°). Reuse the old gasket as the drain plug will be removed again. Use Toyota Genuine ATF WS. Be sure to add automatic transmission fluid slowly. 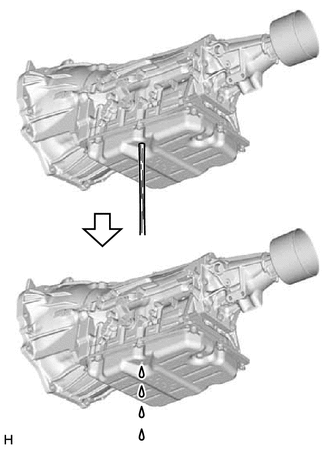 If automatic transmission fluid is added quickly, the automatic transmission fluid may hit internal parts and bounce back, resulting in automatic transmission fluid coming out of the refill hole. Reuse the old gasket as the overflow plug will be removed again. 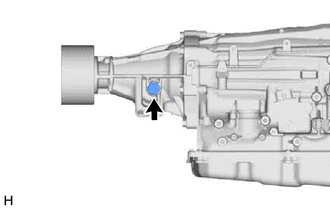 If the specified amount of automatic transmission fluid cannot be added, perform steps [*10] to [*15]. Reuse the old O-ring as the refill plug will be removed again. To reduce load, make sure that all electrical systems, such as the air conditioning, lighting system, electric fan and audio system, are off. (p) Repeat steps [*1] to [*15]. (q) Repeat steps [*1] to [*2]. 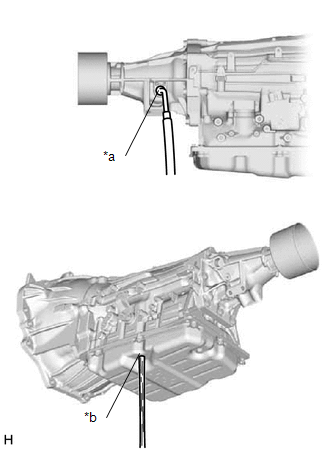 (r) Install a new gasket and the drain plug to the automatic transmission assembly. (s) Repeat steps [*4] to [*11]. 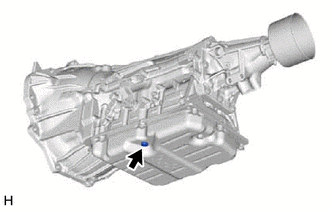 Approximately 50% or more of the automatic transmission fluid has been replaced during a repair of the transmission or a similar operation (See page ).